Group Visits at Fairhaven Woodland and Water Garden01603 270449work Group VisitsFairhaven Woodland and Water Garden is a secret hideaway in the heart of the Norfolk Broads. Fabulous spring flowers, relaxing summer concerts, stunning autumn colours and great winter bird-watching. Wheelchair friendly, children's quiz, dogs on leads welcome and boat trips on our private broad. Why not visit the award-winning tearoom and sample a home-made cake or scone? GROUP TRAVEL FACILITIES: Group sizes - min 15 max 60, pre-booking required 7 days in advance, coach parking on site, driver / organiser incentives, guided group tours, full catering facilities, toilets, shop. SUGGESTED LENGTH OF VISIT: Minimum 3 hours for the garden and a tea/lunch stop combined. ACCESSIBILITY: Full access by wheelchair to all facilities, majority access to gardens. Hearing loop in facilities and some braille information points in garden. 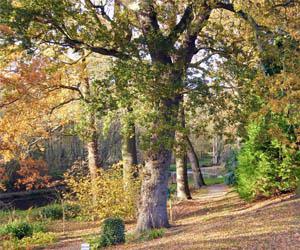 Fairhaven Woodland and Water Garden is a secret hideaway in the heart of the Norfolk Broads. Fabulous spring flowers, relaxing summer concerts, stunning autumn colours and great winter bird-watching. Wheelchair friendly, children's quiz, dogs on leads welcome and boat trips on our private broad. Why not visit the award-winning tearoom and sample a home-made cake or scone? MEAL STOPS: 50 covers inside, a further 80 outside. As well as group entry prices, ask about our group catering prices. Group rates - adults £5, seniors £4.50, children £2.50.